Add a personal touch to your gift-giving this holiday season! It's that time of year. Time for bells and snow and...wrapping presents! No matter the holidays you celebrate, in this class you'll learn fun techniques that will help your gifts stand out this year. 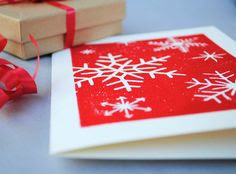 We'll be experimenting with different ways to decorate wrapping paper, bags, gift tags and cards. We'll even cover a few fun ways to embellish your gifts. So join us for this useful and festive workshop!